I'm Chris Shattuck, and this is 'How to Build and Modify a Drupal Theme or Sub-Theme. ' In this video, we are going to take a look at how a theme works, and how to build a theme or sub-theme from scratch. In this section what we're going to do is look at the themes that ship with Core Drupal, we'll look at some of the other folders that are included in the themes directory, and then we'll show you where to put a new theme as you're adding it to your Drupal site. I'm starting here in the root directory of the Drupal site, and what I'm going to do is expand the themes folder here. And let's take a look at what's inside. 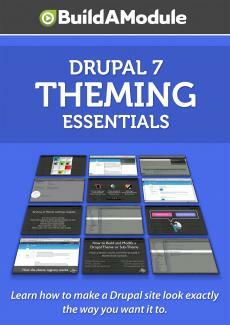 Now, several of these folders are themes that are included with Drupal, and that's Bartik, Garland, Seven, and Stark. And then there's two other folders here: Engines and Tests. So let's go ahead and knock out these other folders and then take a look at what the different themes are for. Let's go ahead and start with the engines folder. Before I go into detail about what's inside this folder, let me briefly explain what engines are and why you probably won't hear them mentioned very much throughout these tutorials. Ninety-nine percent of the time Drupal uses a template engine called PHP template, and as we work through using templates and working with PHP inside of templates you're actually seeing PHP template, the template engine, in action. All it does is allow us to use that PHP inside of the template file. Now, there are other engines out there that attempt to simplify the process of building a template by layering on top of PHP a separate language that allows themers to use the template files without having to understand PHP constructs. And so in some cases these other engines will be used, but almost all of the time PHP template is the one used; it's the only one that's shipped with Drupal, and it's what ninety-nine percent of the themes are built off of. You don't need to actually interact with the engine layer explicity, but just know that when you're working with template dot php, or any of the theme files, that there's some aspect of what you're doing that does interact with the engine. OK. Let's go ahead and expand this engines folder, and see what's inside. You see there's just one folder called PHP template. And again, if there were multiple engines they would exist as other folders inside of this engines folder. And when we expand that we see just one file, PHP template dot engine. Now because nearly all Drupal work is built off of PHP template, you don't really need to know a whole lot about the other template systems that are out there, but just know that if there's a use case for you where you really need to simplify the process of creating templates or interact with a templating language like Smarty that's being used on another project, then you can use engines, install extra engines inside of Drupal, in order to use those template structures. OK. I'm going to go ahead and close this, and let's take a look at that second folder called 'Tests. ' You'll see tests folders throughout Drupal in module folders, and then this one in the themes directory.